RevFlare delivers business intelligence, alerts and automation to help you generate more revenue, cultivate loyal customers, optimize product strategy and drive profitability. 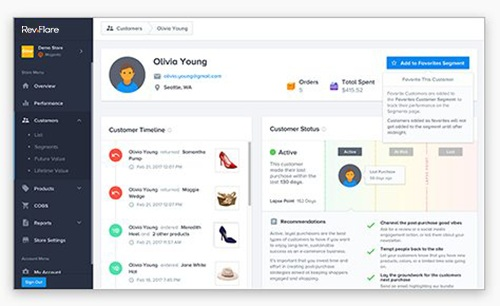 Easily connect your ecommerce platform as well as all the integrations you need such as Google Analytics, Google AdWords, Bing Ads, Facebook Ads, MailChimp and AdRoll. Our integrations make ecommerce analytics and reporting easy. RevFlare provides hundreds of ecommerce insights across performance metrics, product sales, customers, and cost of goods sold. Instantly measure metrics like customer lifetime value, gross margin, net profit, and more to build and automate high-quality ecommerce reports. © RevFlare.io. All rights reserved.